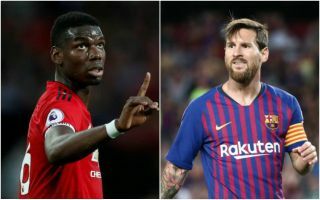 Barcelona star Lionel Messi wants to see his club push the boat out a little and spend big on the transfer of Manchester United midfielder Paul Pogba, according to latest reports. The Argentina international is said to be keen on Pogba joining Barca instead of Ajax starlet Frenkie De Jong, though he currently remains the club’s priority, according to Don Balon. Pogba is certainly the bigger name of the two, and would provide more experience, though of course his form has suffered since he moved to Old Trafford from Juventus just over two years ago. The France international may prove a little too expensive for Barcelona as they seemingly favour De Jong, though Don Balon suggests he won’t come cheap either. Messi therefore wants to see the Catalan giants spend just that little extra on what he thinks would be a superior purchase, says the report. It remains to be seen just how influential the 31-year-old can be with regards to the club’s work in the transfer market, but having played with so many of the best, the board might do well to listen to him. Pogba, 25, does seem like he could be a fine fit at the Nou Camp under a different style of play compared to the one he’s had to adapt to at United. The Daily Mail recently claimed he was keen on joining Barcelona and talk has simply not died down regarding his potential move away, with the new ruling meaning players are not cup tied in the Champions League anymore meaning a January move is surely more likely than it would previously have been.